Mol. Cells. Mar 31, 2019; 42(3): 210-217. We then examined whether ATM inhibition with KU-60019 would improve the mitochondrial function in young fibroblasts. ATM inhibition with KU-60019 reduced the levels of phosphorylated ATM (p-ATM) in young fibroblasts ( Supplementary Figs. 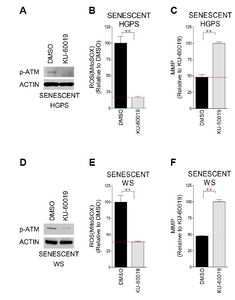 S1A and S1D), consistent with the results in senescent fibroblasts (Figs. 1A and 1D). We measured ROS levels and MMP to assess mitochondrial function (Rottenberg and Wu, 1998). KU-60019 treatment significantly reduced ROS levels and increased MMP, suggestive of mitochondrial functional enhancement in young fibroblasts ( Supplementary Figs. S1B, S1C, S1E and S1F). However, ROS reduction by KU-60019 treatment was less effective in young than senescent fibroblasts (31.3% vs. 83.6% reduction in HGPS and 32.7% vs. 61.7% reduction in WS), as was MMP increase by KU-60019 treatment (17.2% vs. 51.8% increase in HGPS and 35.4% vs. 52.5% increase in WS)(Fig. 1 and Supplementary Fig. S1). 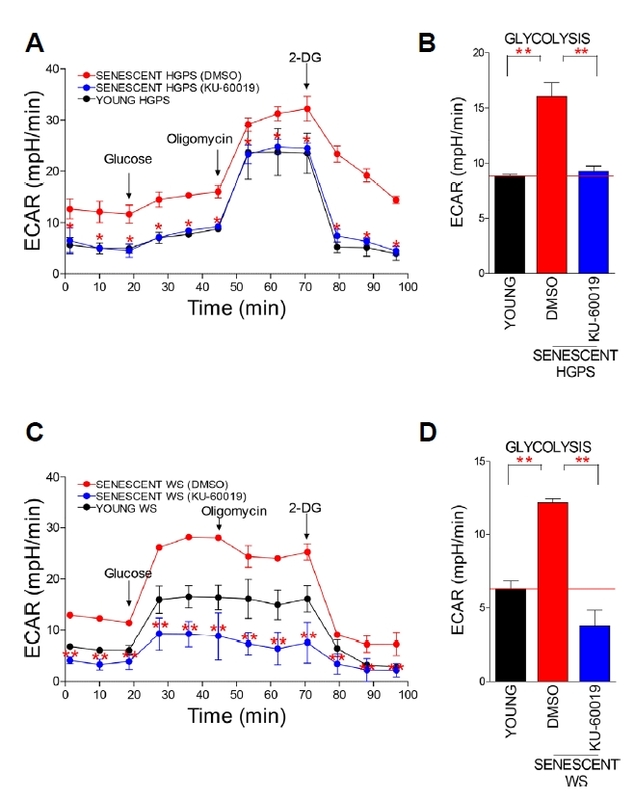 These data suggest that KU-60019 treatment enhances mitochondrial function in young fibroblasts, provided ATM activity was adjusted to a proper level. Finally, we examined whether other ATM inhibitors yielded similar phenotypes as those observed after KU-60019 treatment. CP-466722 was selected an alternative ATM inhibitor (Weber and Ryan, 2015). CP-466722 treatment yielded recovered mitochondrial function as shown by the decreased ROS levels and the increased MMP ( Supplementary Figs. S2A, S2B, S2D and S2E). Furthermore, CP-466722 treatment significantly decreased the lipofuscin accumulation ( Supplementary Figs. S2C and S2F), suggesting that CP-466722 as another ATM inhibitor afforded similar phenotypes as KU-60019. Mol. Cells.Mar 31, 2019; 42(3): 210-217. Received August 20, 2018; Accepted January 7, 2019. 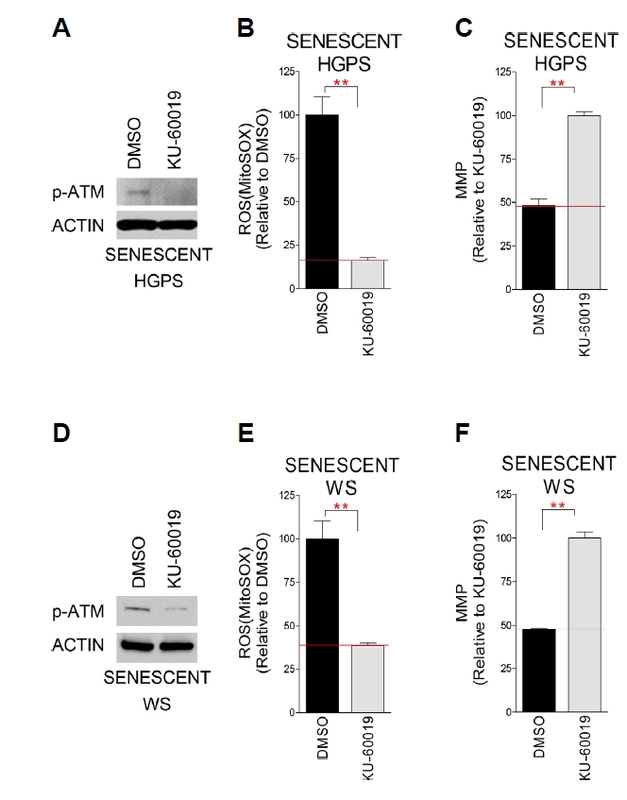 Specificity of KU-60019 as an ATM inhibitor in senescent HGPS (A) and WS (D) fibroblasts. Flow cytometric analysis of mitochondrial ROS levels using MitoSOX in senescent HGPS (B) and WS (E) fibroblasts (*P < 0.05, **P < 0.01, Student’s t-test). Mean ± S.D., N = 3. Flow cytometric analysis of mitochondrial membrane potential using JC-1 in senescent HGPS (C) and WS (F) fibroblasts (**P < 0.01, Student’s t-test). Means ± S.D., N = 3. 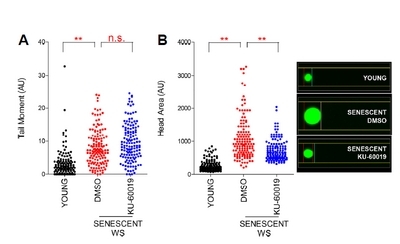 Measurement of ECAR in HGPS (A) and WS (C) fibroblasts (black line: young cells, red line: DMSO-treated senescent cells, and blue line: KU-60019-treated senescent cells) (*P < 0.05, Student’s t-test). Means ± S.D., N = 3. Measurement of the glycolysis level in HGPS (B) and WS (D) fibroblasts (**P < 0.01, Student’s t-test). Means ± S.D., N = 3. Quantification of SA-β gal positive cells in senescent HGPS (A) and WS (E) fibroblasts (**P < 0.01, Student’s t-test; scale bar 20: μm). Means ± S.D., N = 3. Flow cytometric analysis of autofluorescence in senescent HGPS (B) and WS (F) fibroblasts (**P < 0.01, Student’s t-test). Means ± S.D., N = 3. Flow cytometric analysis of lysosomal mass in senescent HGPS (C) and WS (G) fibroblasts (**P < 0.01, Student’s t-test). Means ± S.D., N = 3. 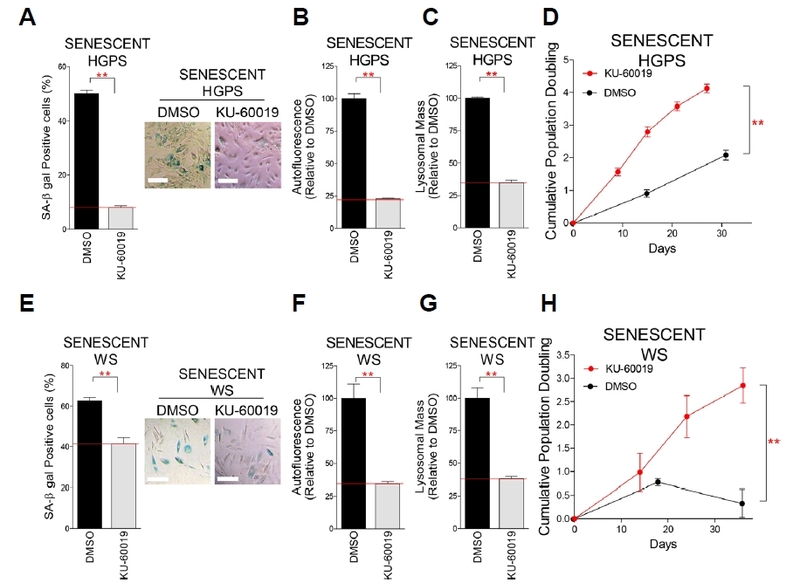 Effects of KU-60019 treatment on CPD in senescent HGPS (D) and WS (H) fibroblasts. (**P < 0.01, Student’s t-test). Means ± S.D., N = 3. 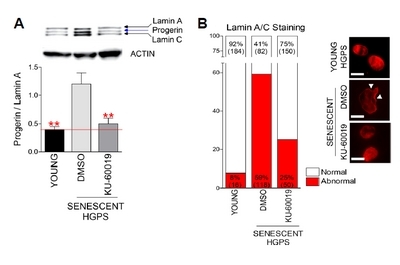 (A) The ratio of progerin to lamin A as a criterion to determine disease severity in HGPS. (**P < 0.01, one-way ANOVA followed by Bonferroni’s multiple comparison test). Means ± S.D., N = 3. (B) Measurement of abnormal nuclear structures (red: lamin A/C, arrow head: abnormal nuclear structure, scale bar: 5 μm). N = 200. Cells were treated with DMSO or 0.5 μM KU-60019 for 14 days. (A) Neutral comet assay to measure tail moment (A) and head area (B) in WS fibroblasts (**P < 0.01, n.s. : not significant, one-way ANOVA followed by Bonferroni’s multiple comparison test). Means ± S.D., N = 100. Cells were treated with DMSO or 0.5 μM KU-60019 for 14 days.